See study by J. Silvertown (2009). Two to many cotyledons occur in different gymnosperms. The angiosperms are divided into two major groups according to number of cotyledons: the monocotyledons and the dicotyledons. Mature gymnosperm seeds contain an endosperm (albumen or nutritive tissue) which surrounds the embryo. In some mature dicotyledon seeds the endosperm persists, the cotyledons are flat and leaflike, and the epicotyl is simply an apical meristem. In other seeds, such as the bean, the growing embryo absorbs the endosperm, and food reserve for germination is stored in fleshy cotyledons. The endosperm persists in common monocotyledons, for example, corn and wheat; and the cotyledon, known as the scutellum, functions as an absorbing organ during germination. Grain embryos also possess a coleoptile and a coleorhiza sheathing the epicotyl and the radicle, respectively. The apical meristems of lateral seed roots also may be differentiated in the embryonic axis near the scutellum of some grains. Physical and biochemical processes of seed growth and germination are controlled by genetic and environmental factors. Conditions of light, temperature, moisture, and oxygen affect the timing and ability of a seed to mature and germinate. Seed development (embryogenesis) is concerned with the synthesis and storage of carbohydrate, protein, and oil to supply nutrients to the germinating seedling prior to soil emergence. Seed development occurs in several stages: rapid cell division, seed fill, and desiccation. The timing of each stage is species-specific and environmentally influenced. Dormancy is terminated in a large number of species when an imbibed seed is illuminated with white light. Biochemical control of this process is related to the functioning of a single pigment, phytochrome, frequently located in the seed coat or embryonic axis. Phytochrome imparts to the seed the ability to interpret light quality, such as that under an existing vegetative canopy, and to distinguish light from dark with respect to its position in the soil. Phytochrome also is affected by temperature and is involved in the seasonal control of the ending of dormancy. Hormones that promote germination of dormant seeds include gibberellins, cytokinins, ethylene, and auxins. Germination is the process whereby a viable seed takes up water and the radicle (primary root) or hypocotyl emerges from the seed under species-specific conditions of moisture, oxygen, and temperature. Dormant seeds must undergo additional environmental stimuli to germinate. The germinating seed undergoes cell expansion, as well as increases in respiration, protein synthesis, and other metabolic activities prior to emergence of the growing seedling. an organ of seed plants that performs the functions of reproduction, repopulation, and, in unfavorable conditions, survival. In the course of evolution of heterosporous higher plants the seed arose in connection with changes in conditions of existence (for example, climatic conditions) as an ontogenetic phase between the sexual process that occurs within the megasporangium (the seed primordium and the ovule) and the adult plant. For this reason the seed usually develops after fertilization. It sometimes develops secondarily, without fertilization; this phenomenon is called apomixis. The number of seeds formed on a single plant cannot exceed the number of mega-sporangia that developed as a result of asexual reproduction. In the first seed plants—seed ferns (Lyginopteridopsida)—the seeds probably developed on the ends or in the axils of the telomes. In gymnosperms the seeds develop on open sporophylls (seed scales); in angiosperms they develop in the fruit, which is formed mainly by closed carpels. The type of seed is determined by the type and orientation of the ovule from which the seed develops. In some cases, however, owing to uneven growth of the young seed after fertilization, the seed may differ in type from the ovule. On the seed surface it is usually possible to distinguish the hilum, that is, the site where the mature seed abscises from the funiculus. The micropyle at the lower end may remain in the form of a pore; the remains of the chalaza on the end of the cotyledon are in the form of a variously colored spot, nodule, or pore. 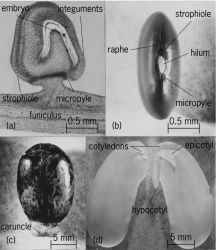 The raphe between the hilum and the chalaza in anatropous seeds arises as a result of concrescence of the upper part of the funiculus with the ovule. Often the seed has outgrowths, for example, an aril, a caruncle, arillods, or strophioles, which ensure myrmecochory. The surface of the seed may be smooth and glossy (pea), reticulately dimpled (henbane), thorny (cockle), nodular (chickweed), or scaly (monkshood). Some seeds form wings (eremurus, bignoniad) or hairs over the entire surface (cotton). A seed consists of the testa (spermoderm), the embryo (young sporophyte), and, in many plants, the perisperm or endosperm (tissues with reserve nutrient matter that develop outside the embryo). The testa is formed from the integuments, or coverings, of the ovule and serves to protect the embryo and often to help in seed dispersal. When two integuments develop in the testa one may often distinguish an outer one (pomegranate and gooseberry have a succulent outer integument) and an inner one. When there is a single integument, sometimes owing to the destruction of the second one during seed development, the testa usually consists of several layers of cells. The hardness of the testa is increased as a result of tissue sclerification. A thin testa is characteristic of seeds of parasitic plants (for example, Orobanchaceae) and orchids, as well as of seeds enclosed in monospermous indehiscent fruits (for example, nuts). Seeds lacking a testa are found among Santalaceae, Loranthaceae, and other hemiparasites. The embryo usually forms from the zygote, that is, the fertilized egg cell, and sometimes from other cells of the embryo sac or of the nucellus of the ovule (polyembriony). Embryos may vary in shape and in their position in relation to the testa, the perisperm, and the endosperm. Development of the embryo in the seed occurs owing to the accumulation of nutrient matter in the endosperm and perisperm or in the cotyledons. The endosperm in gymnosperms consists of a vegetative part of the, female prothallium; in angiosperms it consists of a neoplasm that arises as a result of the merging of the second spermatozoid with the secondary nucleus of the embryo sac (double fertilization). The perisperm consists of remains of tissue of the nucellus or of the nucleus of the ovule. A seed may contain both endosperm and perisperm (Piperaceae, Nymphaeaceae), endosperm only (Ranunculaceae), perisperm only (Caryophyllaceae), or neither (Leguminosae). In the last case the perisperm does not develop, the endosperm is completely absorbed by the developing embryo, and the nutrient matter is stored in the cells of the cotyledons. A seed with an endosperm is often incorrectly called albuminous. The presence of an endosperm and a perisperm in a seed is considered a primitive character. The deposit of nutrient matter in the body of the embryo is progressive. Reserve substances of the seed include proteins, fats, starch, sugar, vitamins, and hemicelluloses. Formed inclusions are protein granules, often with crystals of protein, globoids of a double salt of inosinic acid, and crystals of calcium oxalate. The external and internal structure of seeds is genetically constant and, thus, is useful in the taxonomy of plants. Seeds vary in size and weight; they range from tiny, dustlike particles in Orchidaceae (for example, a seed of Goodyera repens weighs 0.002 mg, and that of Dendrobium attenuatum 0.005 mg) to large nuts in palms (for example, the seed of a sea coconut weighs up to 9 kg). The number of seeds in a single fruit ranges from one (Gramineae, Compositae) to hundreds of thousands and even millions (in some Orchidaceae). The number of seeds in a single plant may be vast (in Amaranthus up to 500,000 and in Sisymbrium up to 750,000). The length of time that a seed retains its viability varies in different species and depends on storage conditions. Thus, willow seeds generally remain viable for no longer than several days; in closed vessels at temperatures of 12°-13 °C, however, they retain their viability 150 to 320 days. The hard seeds of certain legumes can sprout after 100 years, and lotus seeds preserved in a layer of peat for several hundred years have proved to be viable. Seeds are planted by man for use as food or food seasoning and to obtain oils, starch, dyes, medicines, and other substances. The seeds of many plants, as well as meal and oil cake made from them, are used as feed for cattle and poultry. The hairs of cotton seeds are used by the textile industry and in medicine (hygroscopic cotton). Sometimes dry, indehiscent monospermous fruits (grains, buckwheat, flax), entire collective fruits (sugarbeet), and tubers (potato) are erroneously called seeds. The study of seeds is called seed science. Takhtadzhian, A. L. Morfologicheskaia evoliutsiia pokrylosemennykh. Moscow, 1948. Tsinger, N. V. Semia, ego razvitie i fiziologicheskie svoistva. Moscow, 1958. Aleksandrov, V. G. Anatomiia rastenii, 4th ed. Moscow, 1966. Botanika vol. 1.7th ed. Moscow, 1966. Gaetner, J. De fructibus et seminibus plantarum. Stuttgart, 1788. Martin, A. C. “The Comparative Internal Morphology of Seeds.” The American Midland Naturalist, 1946, vol. 36, no. 3, pp. 513–660. What does it mean when you dream about a seed? The seed represents reproduction of life—human, animal, or plant. Everything from the knowledge we import (“plant a seed in their memory”) to the money we use to finance business ventures (seed money) germinates metaphorically from a “seed.” A seed may indicate an idea has been planted in the dreamer’s mind and is germinating into new life experiences. A fertilized ovule containing an embryo which forms a new plant upon germination. A small, single crystal of a desired substance added to a solution to induce crystallization. An initial number used by an algorithm such as a random number generator. A small, single crystal of semiconductor material used to start the growth of a large, single crystal for use in cutting semiconductor wafers. (1) The starting value used by a random number generation routine to create random numbers. (2) A BitTorrent user who has a file that can be downloaded to another user. See BitTorrent seed. (3) (SEED) (Self-Electro-optic-Effect Device) An optical transistor developed by David Miller at Bell Labs in 1986. Seeds symbolize new opportunities and new beginnings. Just as a seed is the beginning of a new life (or its earliest stage), your unconscious may be telling you that the ideas you have planted are beginning to germinate. Additionally, past experiences and hard work may be leading to new opportunities or possibilities. Although earlier research by other scientists has illustrated cholesterol-lowering and weight-control effects from highly purified extracts of winemaking byproducts, we're told that this research is the first to show that flour milled from whole grape seeds, with a little of their natural oil, is able to reduce blood cholesterol levels. ARS and WholeVine Products are seeking a patent for their grape seed flour discoveries. In comparison with rats that received 5-fluorouracil alone, those that received grape seed had less intestinal damage and up to 55% less inflammation. Researchers at the US Institute for Food Safety and Health, who are studying the effect of grape seeds, also believe they could have a beneficial effect on insulin levels, which could also help diabetes patients. Botanic Innovations also promotes white grape seed oil and organic red grape seed oil. MegaNaturai[R]- BP Grape Seed Extract-supports healthy blood pressure. A Some research suggests that grape seed extract may reduce blood pressure, improve cholesterol levels, help with poor circulation in the veins, and have beneficial effects on diabetic retinopathy (an eye disorder). The grape seed extract (GSE) was concentrated by a rotary evaporator (Heildolph, Germany) at about 45[degrees]C and then dried under very low pressure. As regards high level of grape cultivation in Iran and producing high volume of grape juice in this country therefore there is a lot of grape seed in Iran as a byproduct. Supplements containing grape seed extracts have long been available in the market and functional foods have been introduced in recent years.